Phil Ashton was the manager of Guildford during the years that we were part of the scene. He said that Mickey and I were good ambassadors for the mall, and good for business. For any of the different promotions they held, they knew we would go in costume, and participate in the overall picture. 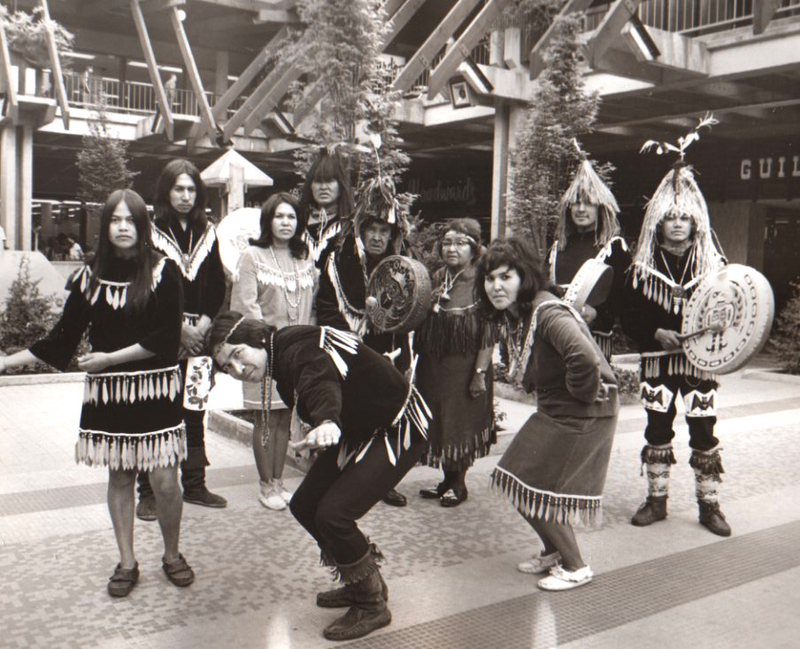 During Western Days they asked if we could get any of the native Indians to participate… so we invited Bob George and his dance troupe. Bob, Lenny, Ann and Marie were all Dan’s family. Dominic Charlie and his wife were there as were some of Dan’s nieces and nephews. A great group that put on some good shows in the mall. At this show Mickey had told Bob something that I was unaware of. They were doing the show, and Bob made an announcement. The next song was for his sister, Norma McGuire, as it was her birthday that day. The following year we were at a gathering at the reserve in North Vancouver, and the same group was the entertainment. And Bob dedicated a song to his sister, Norma McGuire, once again for my birthday. I was shocked and very pleased that he remembered it! Many, many happy memories from our brothers and sisters. Good morning Norma I only brought a few goodies ,for like you said we all over indulged with the sweets over the holidays. Another wonderful story Norma and that is great looking dance troupe. I like there costumes! Your brother dedicating a birthday song to you shows how much he loves and respects you! Thanks for the cup of tea and have a wonderful day my friend! Keep shining! Enjoy your day – filled with sunshine, on so many levels. Hi Heather! Carol and Shari are teaching me some hard earned lessons! Hope I can learn them. Good morning Dianne. So good of you to come and to enjoy a cup of tea with me. Thanks for your kind comments. I do appreciate them. Good morning, Heather. These were very special friends. They have so mulch to teach us if we but just open our hearts to them. My life was certainly enriched on so many levels from knowing them as we did. It’s a treat to read all these great memories of special times with good friends, and I especially like that you include so many interesting photos! Good stuff Norma! Hi Greg! Great to see that you are visiting and I love your comment. Thanks. Did you get a cup of tea? Sorry I didn’t pour one for you and will do better next time!